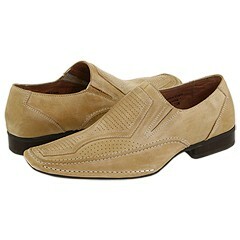 The slip-on dress shoes created by Fratelli are made for comfort wear. The soft leather lining and smooth leather upper create a stylish and comfortable shoe for extended wear. Known only as 8203, the shoe dual elastic goring, a smooth mock toe silhouette and lightly padded footbed. Available colors are black, cognac and eggshell (shown).